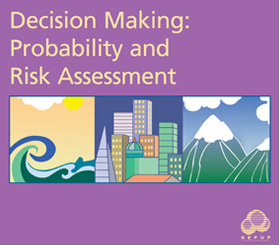 Decision Making: Probability and Risk Assessment is a SEPUP module designed for use in grades 7–12. The module contains a series of 11 activities that provide approximately 3 weeks of instruction. This module focuses on how mathematical reasoning can be used to make decisions in everyday life. Marble-rolling activities, number cubes, and coin tosses are used to introduce probability. After reading historical case studies, students are presented with a hypothetical life-or-death scenario involving the spread of an infectious disease. They decide how to reduce risks associated with local disasters, whether they occur naturally or as a result of human intervention. Students are assessed on their ability to use evidence and identify trade-offs when making a decision.